Purchase eyewear from our Optical Boutique and we guarantee your satisfaction with your comfort and vision. Our Perfect Fit Guarantee arose from our experience that too many people make do with ill-fitting frames or lens products that do not work well with their prescription. No-one should live with uncomfortable eyewear that slips down the nose, hurts behind the ears, or interferes with your activities or natural eyesight. 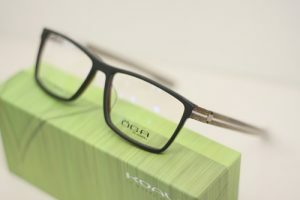 Just like tailored clothing, eyeglasses should be properly fitted to the wearer. Properly fitted glasses look more attractive, help you see better and are more comfortable. 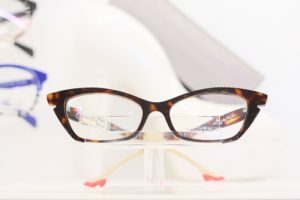 But to achieve the desired vision effect, the frame must be very carefully chosen to place and hold the optical lenses in front of the eyes in the correct position. Our professional staff will help you choose the right frame for your facial features, the shape of your face and size of your head. They will custom fit the frame and lenses to the shape of your features so you leave our office looking good and seeing well. If the eyes are the window to the soul, then they certainly deserve a beautiful frame. Eyeglasses do so much more than help you see better, they are a fabulous fashion accessory and an expression of your individual style. 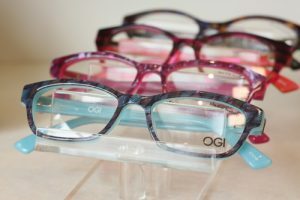 Classic, retro, or big and bold, our optical staff will help fit you with glasses that best express your personality. We track the latest in eyewear fashions from New York, London, Milan and Paris. 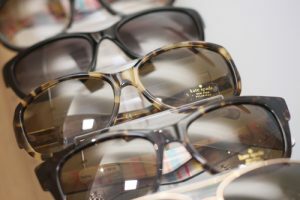 Be sure to follow us on social media for fashionable eyewear trends and updates on our latest shipments of designer eyewear. What does your eyewear need to do for you? Do you need high performance frames for sports, driving or your occupation? Our staff will walk you through all the options to help you find frames that will best suit your lifestyle. Why not take the opportunity to make a statement? Whether your style is various shades of denim or a finely fitted suit, we have a wide variety of fashionable frames to suit your personal style. Bland and boring children’s glasses are thankfully a thing of the past. Our selection of kid’s eyewear is fun, fashionable and priced to fit any budget. We source our children’s frames from premium suppliers, so you’ll be assured of receiving a high-quality frame that can take the bumps, scuffs and crashes that kids throw at them. We guarantee most children’s frames against breakage for two years from purchase. 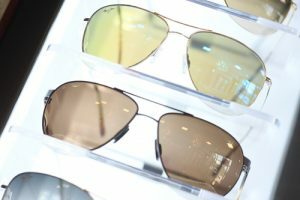 We have a wide variety of sunglasses to fit your activities and lifestyle. From fabulous designer fashions to premium sport frames, we have your eyes covered. Sunglasses are a must-have for eye protection in the Okanagan Valley. Spring skiing season quickly changes to boating season and both sports involve lighting conditions that can be damaging to the eyes. Besides making a fashion statement, wearing sunglasses is critical for blocking Ultra-Violet (UV) radiation. UV light rays can increase the risk of several age-related eye problems including cataracts and macular degeneration. Children’s eyes are particularly sensitive to the harmful effects of UV radiation because their eyes are still developing and they are likely to spend more time outdoors than adults. Who says the words “budget” and “fashion” can’t go together? We want you to see well and look great! We’ll help you find a great frame, combine it with quality lenses and provide it to you at exceptional pricing. Our staff will help you select the frames that compliment your personal style, appropriate lenses to best solve your vision needs and adjust your frame to a perfect fit. Copyright 2017 Family First Optometry | All Rights Reserved.